The Brooks Brothers clothing chain launched four new fragrances last year: Madison for women, and three new unisex scents under the Black Fleece range, Red, White and Blue. 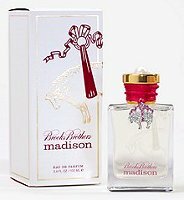 Madison ~ "Introducing Brooks Brothers Madison for her, a new style of signature fragrance that captures the essence of the feminine, flirty and glamorous. Madison is filled with dramatic notes of night-blooming jasmine, pink peony and purple rose maroc against a sensual background of deep Tuscan leather and spicy pink saffron." Available in 15 or 100 ml Eau de Parfum or in a solid perfume ring. Black Fleece Red (not shown) ~ "Red is a unisex cologne splash. The fragrance is an earthy and warm. Rum, cardamom and citrus create the scent with hints of tobbaco and nutmeg. Rich undertones of sandelwood and leather complete the scent." [sic, sic & sic] In 90 ml Cologne. Black Fleece White (not shown) ~ "White is a unisex cologne splash. The fragrance is clean and fresh. A golden citrus base is enhanced with thyme and lavender. Rich undertones of cedard [sic] and vetyer complete the scent." In 90 ml Cologne. Black Fleece Blue ~ "Blue is a unisex cologne splash. The fragrance is classic and vibrant. Bergamot and mint are combined with iris and balsam." Ah yes, for those femmine, flirty, glamourous grey wool blend menswear looking pantsuits. I have not been in there for so long I don’t even know what they’re making now. I did think they had sort of modernized though? Based on the outlet selections near me, their woman’s clothes are still “dress for success” and rather dreary. Actually, they never did manage to figure out how to come up with a woman’s line to equal their “conservative but nontheless essential” businessman’s clothing. What the heck? I still haven’t tried the original Black Fleece yet. That one sounded really appealing. Is it only available in the stores? I think they’re only in the stores, yes. So far as I know. A new perfume friend and I are talking about exploring all the sort-of exclusive and one-off stores sometime (Wilkes-Bashford carries Penhaligon’s here – who knew?) and this could very well be a stop to make. If we even have one here. We must. Madison & Black Fleece Red look yummy. I’m with you–rum, cardamom, nutmeg and tobacco sounds lovely!